Designed to gently maneuver stretcher under patient without rolling or lifting. The immobilization of the patient in the position found, minimizes the risk of complicating the existing injuries. The center of the stretcher can be opened to allow the patient to be X-rayed while secured on the stretcher. Features include sturdy, lightweight aluminum construction with an adjustable length and three patient restraint straps. Folds for easy storing and separates in half during application and removal. DIMENSIONS: 66 1/4" L; 17 1/2" W; 2 5/8" D; Folded: 49 1/2" L; 3 1/2"D; Adjustable to 80"
Adjustable collar for Extrication. The Perfit ACE collar actually adjusts to ANY adult size with 16 different settings ranging from Neckless to tall. 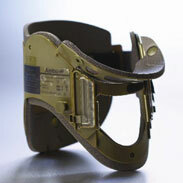 The Perfit ACE incorporates latches which, allow the rescuer to size the collar according to the victims neck size. Two safety buttons hold the collar in palce for maximum reliability. JSA-333-A Splint Stretcher Kit: JSA-300 Series stretcher. Model shown is JSA300-A Stretcher. (Please specify model stretcher when ordering). Kit also includes two JSA-502 Safety Blankets and one JSA-300-X Stretcher Bridle Sling. Made of 1" sturdy anodized aluminum tubing frame with flush folding hinges. Four inch wheels and posts fold easily out of the way for compact storage. Cover is fabricated from tough 18 oz. green vinyl coated nylon. Cover is fungus and rot resistant and easily wiped clean. 2" wide patient restraint straps with automotive seatbelt type buckles are standard equipment. TIII Leg Traction devices are a cost effective means of meeting your traction splint requirements. They are not adjustable in length but do come in both Pediatric and Adult Sizes. Kit comes complete with all straps, ankle hitch and carry case. Junkin Safety 74" X 1 1/4" EZ Fold Stretcher Junkin Stretcher Easy fold stretcher with 2" wide patient restraint straps, folds for compact storage. Made of 1" sturdy anodized aluminum tubing frame with flush folding hinges. Wall mountable. Vinyl-coated storage bag sold separately.